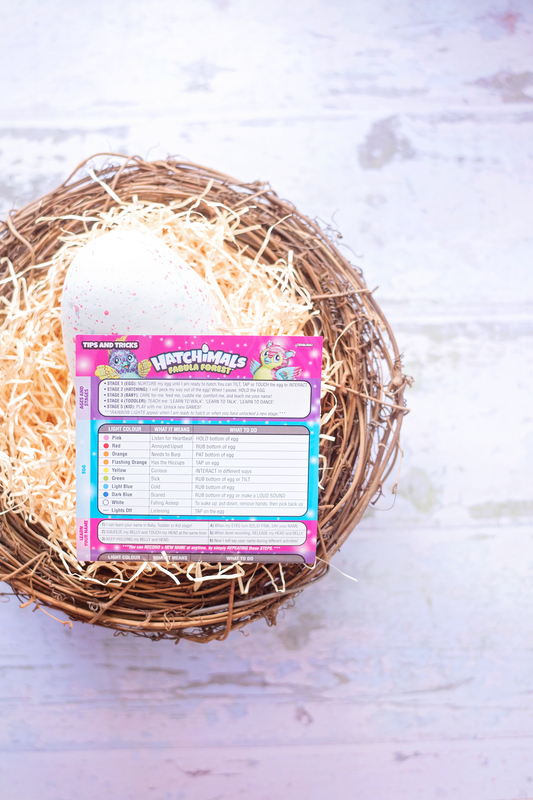 HATCHIMALS FABULA FOREST REVIEW: TIGRETTE OR PUFFATOO? On Christmas day in our home, there was such a commotion – and it was all my fault. Yotie was sent a Hatchimal by Father Christmas – and not just an ordinary Hatchimal, but the TWIN Hatchimals. Wonder how many times I can say Hatchimal? Lots. Anyhow, I offered to take him out of the box for Yotie and having an aversion to instructions, I unclipped the two pegs in the bottom of the egg, handed him to Yotie and told him to look after his egg – and whilst Gav was reading the instructions, our poor middle child was hugging and loving his Hatchimal egg whilst it cooed away at him, and suddenly it hatched on him. 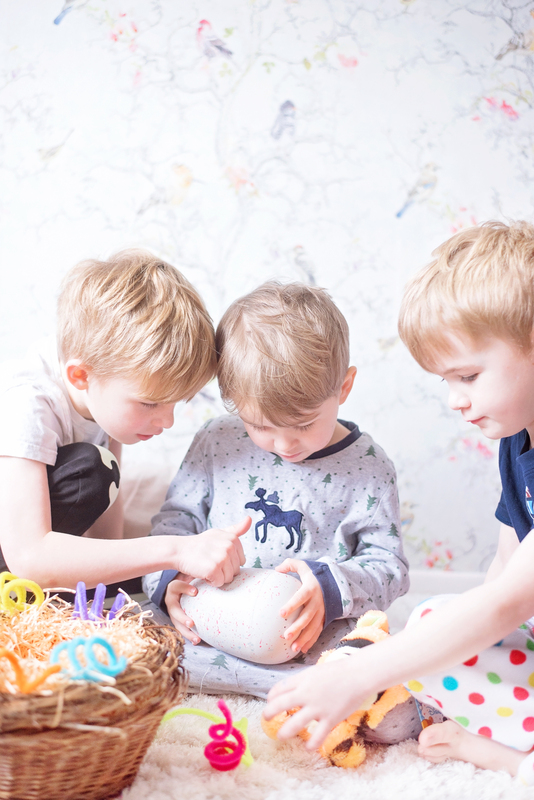 A pop and the top cracked off, and one very surprised little boy sat there who had no idea what had happened and two brothers who were upset they’d missed the birth of the new Hatchimals. There were tears and it was all my fault. 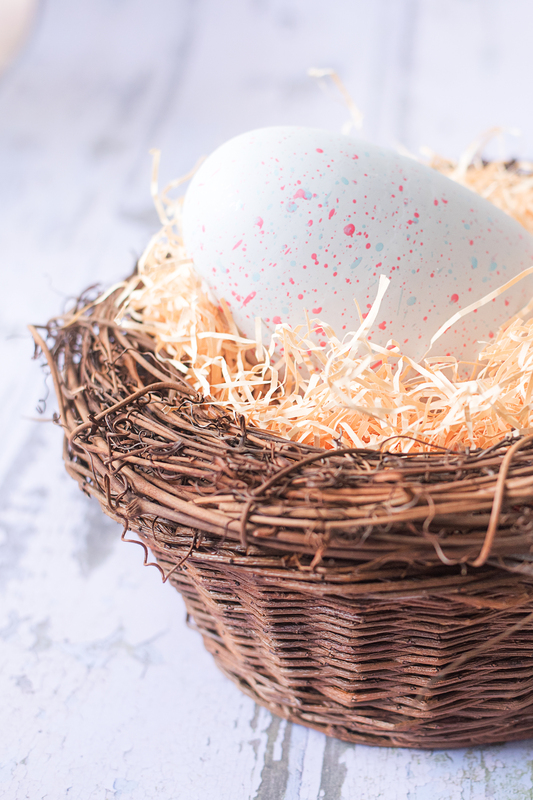 Fast forward to this week when we were sent one of the new Hatchimals Fabula Forest Eggs – which could be a Puffaroo or a Tigrette. The boys all watched the box in wonder, having no idea that I’d already taken the egg out to read the instructions this time. 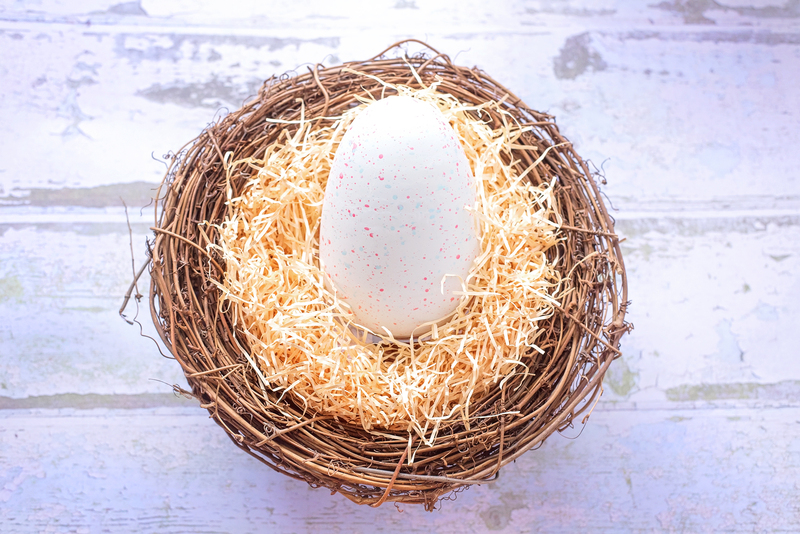 Turns out that you can stop the hatching by turning the egg upside down for about eight seconds – and this time, it took us soooooo much longer to hatch our little one out, as they all took caregiving in turns and poor little Hatchimal got tired and fell asleep on the job quite frequently. So, here’s our beautiful egg. We even made a nest for it. The boys were convinced that it was Tigrette. 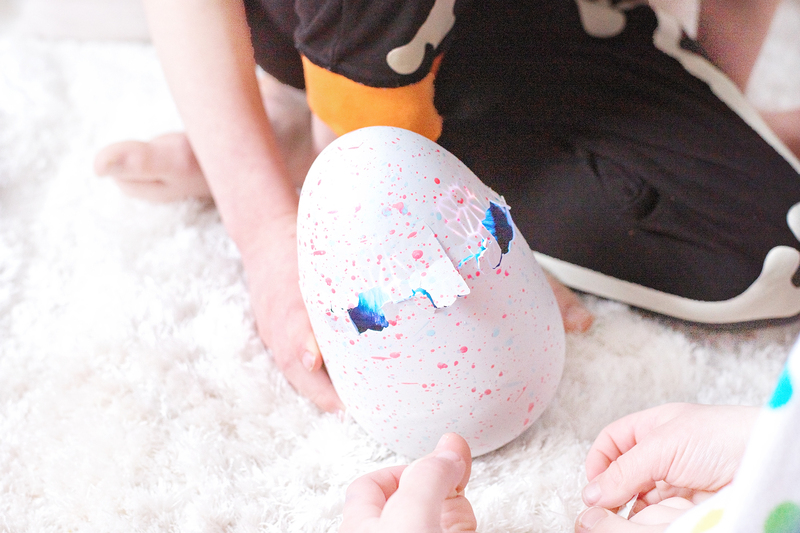 The egg is pretty solid and smooth – we keep the bottom part of the shell to store our little Hatchimals in! These are important. Note that there are many instructions in there. Sort through for your language. If I’d have read this on Christmas morning we’d all have been a lot less tearful. Oops. Read them. Please. There was a lot of stroking and patting of the Hatchimals Fabula Forest egg whilst I re-read the Hatchimals Fabula Forest instructions and Gav got the iPhone ready to video the moment. We weren’t going to miss it this time. One by one they held the Hatchimals Fabula Forest egg, gave it kisses and talked to it. It was really sweet as they all sat around like little fathers waiting to see their baby. 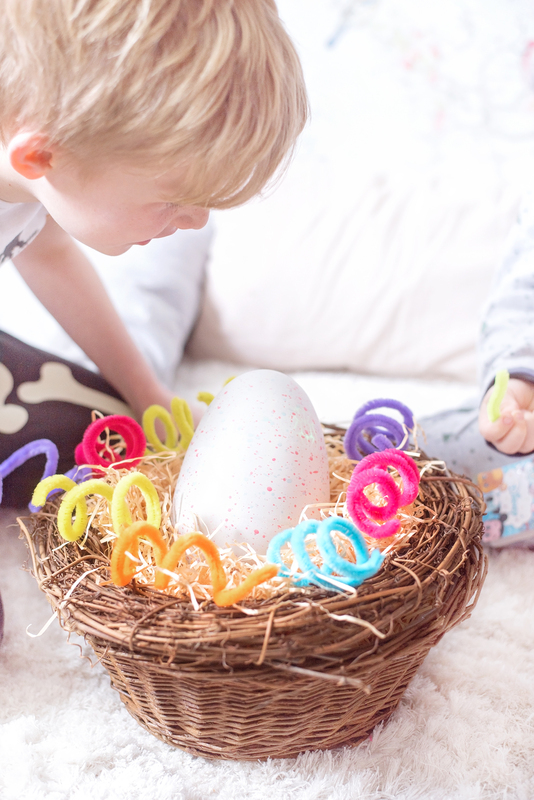 Whilst we were waiting [each time they stopped holding it, our Hatchimals Fabula Forest creature stopped his hatching process] they made him some pipe cleaner worms ready to eat when he was born. Mmm. Delicious. Then the work began. 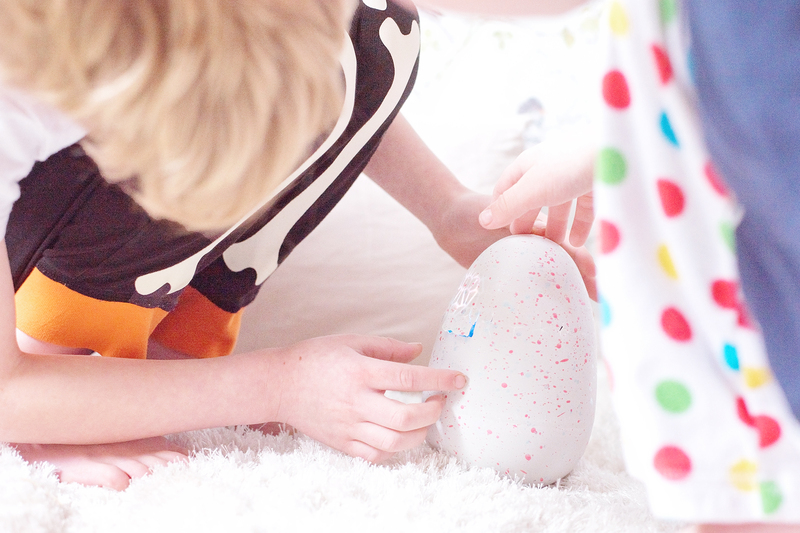 We hugged and cuddled and stroked and kissed our Hatchimal egg and told him we were looking forward to meeting him, and little lights shone through the egg [his eyes] in different colours – they loved seeing that they could translate his feelings by reading the colour chart in the instructions. 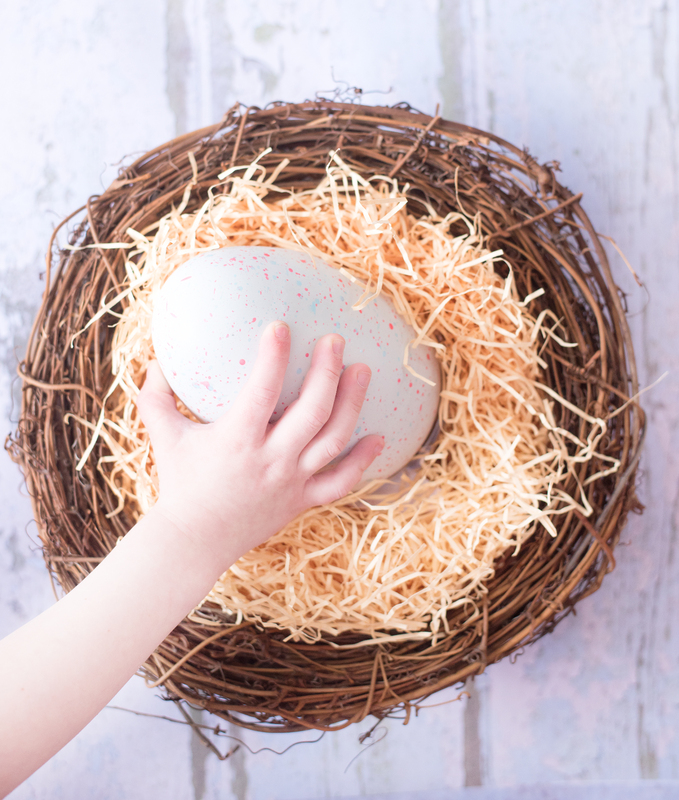 They were shouting he was tired, he was happy, he was ready to come out – and then the pecking started – Our little Hatchimal pecked his way around and around the egg with his little pink beak showing through. After quite a while, we helped our little Hatchimal out of the egg. Hatchimals sometimes need to have a pull to come out of their egg or they’ll keep on pecking around and around. So we all pulled our Hatchimal out like Hatchimal midwives, and the boys were so excited to see that they had a TIGRETTE of their own, as he started to sing “Hatchy Birthday” for himself. WHAT DOES A HATCHIMALS FABULA FOREST CREATURE DO? SO much more than I thought he would! I thought the fun was all in the hatching, which is amazing in itself. Within minutes, the boys were teaching him to say Hero’s name [follow the instructions to do this] and letting him walk around the floor. He plays games and does little tricks that you can teach him. 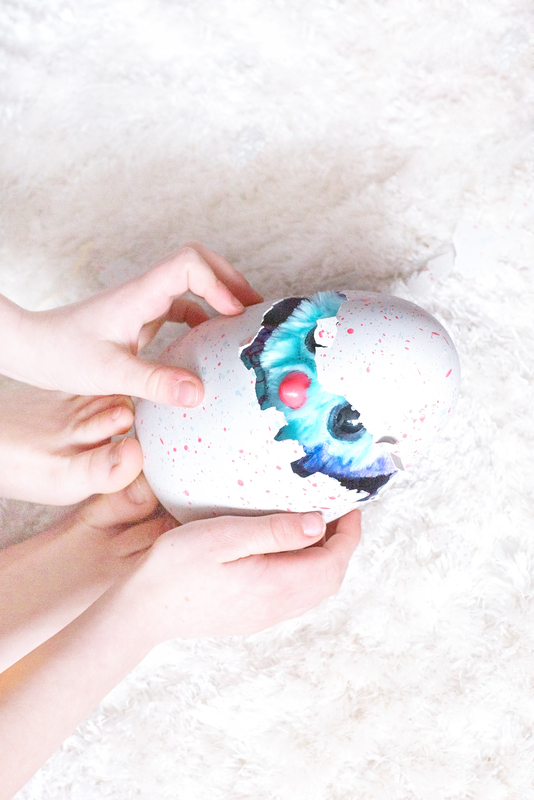 There are several stages to a Hatchimals Fabula Forest creature as they can grow up [baby, toddler and kid, but you can reset your Hatchimal too to start again]! 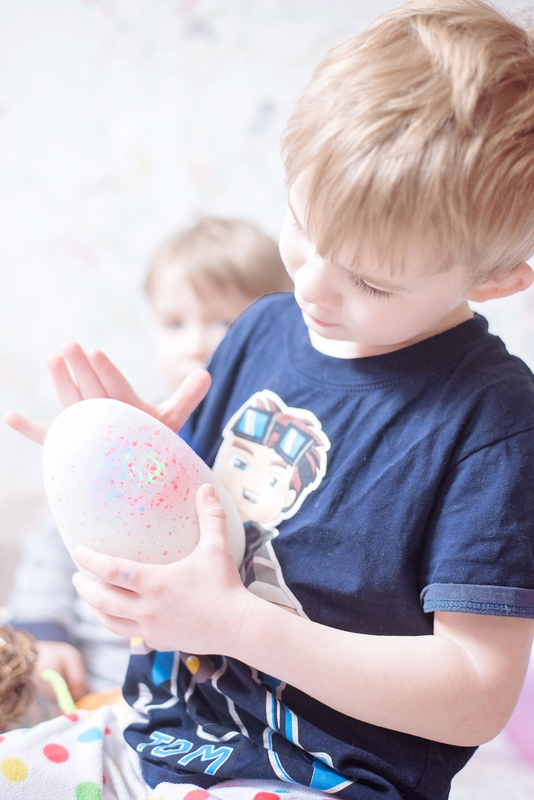 When you turn your little Hatchimal off, he won’t reset to Baby stage – but if you’re like our boys and you randomly want to reset, there’s an easy way to know what stage your Hatchimal is at – press his belly and check the first eye colour he shines. If it’s YELLOW and he’s giggling, your Hatchimal is a Baby, if it’s PURPLE then your Hatchimal is a Toddler, and if his eyes are RED then your Hatchimal has become a Kid. 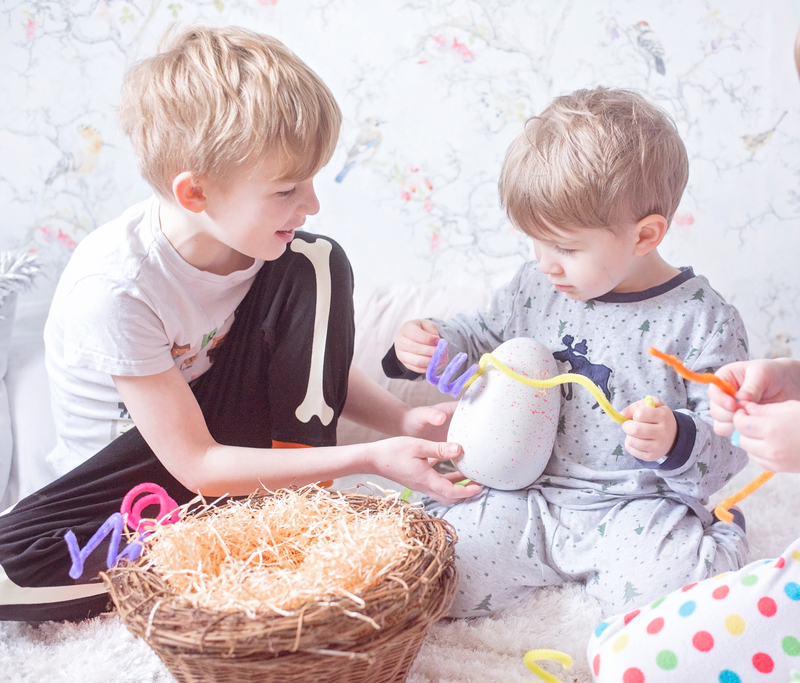 Hatchimals Fabula Forest Eggs retail at around £69.99, and there are also little Hatchimals CollEGGtibles – now in Season 2, that are just as cute but much smaller! Oh my goodness how lovely! Such a nice surprise once it finally hatches and love that it has different stages from baby up – adorable! They just loved it so much – it took about 45 minutes for them to finally hatch it, and it’s the quietest they’ve been all week! Me too – they’re amazing in what they can do! My daughter loves hatchimals and this one looks so lovely! We made a similar mistake with the first one we got her and also had lots of tears! Heard of these toys before. My kids would find them so fascinating. Will check them out. I had heard the word Hatchimals before but I never knew what they were or what they did. I’m glad I finally know. My son would love this although he might get impatient waiting for it to hatch! How cool is this! They remind me of the little furbies I used to have a child except it more fun and exciting way of discovering it! The littles one definitely seem as though they’re loving it! 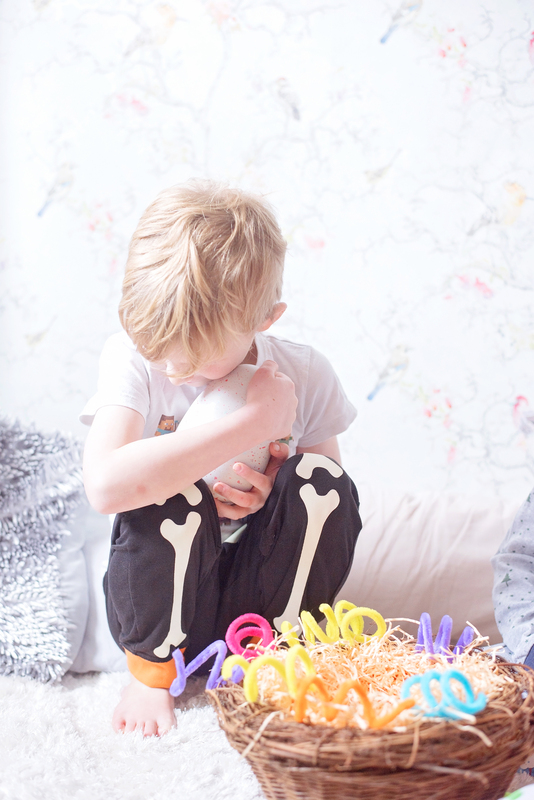 We are huge fans of hatchimals but have none of the bigger ones yet! They are way too cute! As someone of the Furbie and Tamagotchi generation (first time round) it still amazes me what done of these children’s toys can do! My daughter really wants a Hatchimal for her birthday. This one looks great and do much fun waiting for him to hatch. Love the nest!